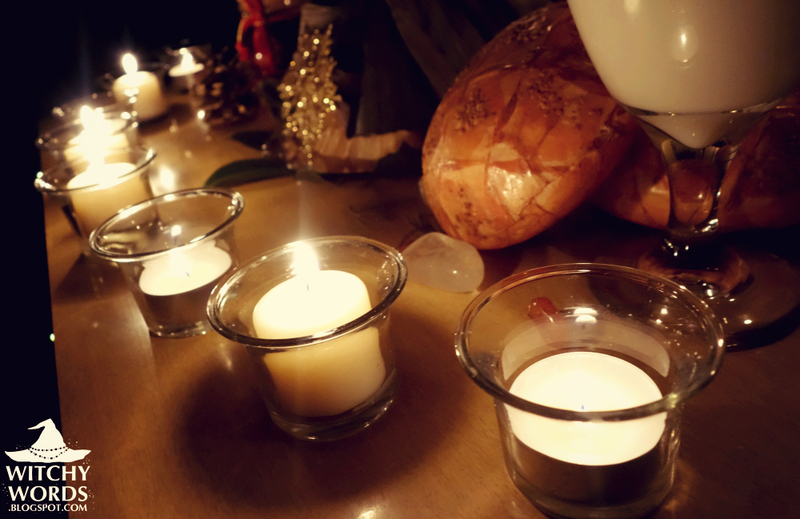 To see 2013's Imbolc altar, click here! To see all sabbat altars, click here! Imbolc is the half-way point between the longest night of the year celebrating the deepest part of winter and the beginning of spring. On this holiday, we feel the budding of life under the snow - the first stirrings of regrowth. For some, this holiday celebrates the goddess Brigid. Given sainthood in Christianity, Brigid represents the sacred flame and is said to visit homes and bestow blessings of growth and prosperity on those who leave her offerings. For others, this holiday represents the Goddess in her maiden form waking barely stirring in her sleep and the young god opening his eyes. 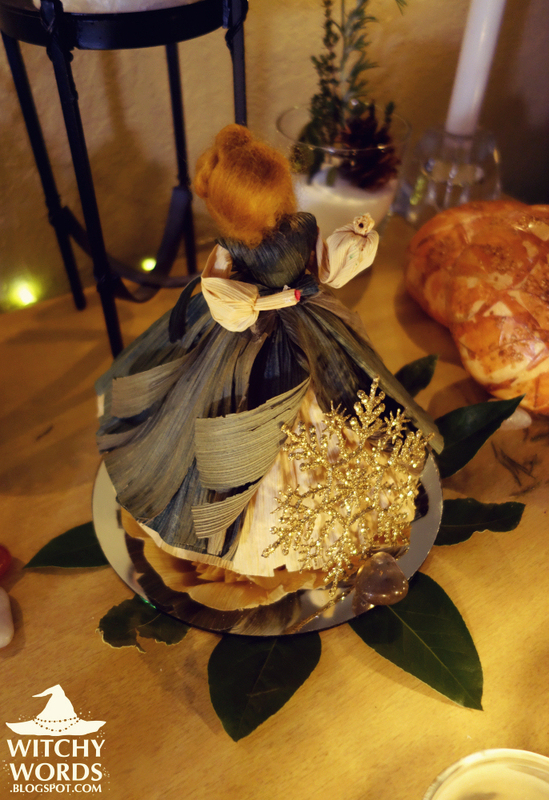 My altar begins in the center with a corn doll figure dressed in green, the color of growth and plants, and adorned with red hair, symbolizing fire. This doll may represent the Goddess, Brigid or the fertility of the land under the snow. She is adorned with a snowflake, representing that snow, and set atop a mirror. Under that mirror, bay is sprouting. The mirror itself represents ice, or a time of reflection, before growth, represented by the bay leaves. This altar has many offerings in hopes for a blessed spring. The first of these are bread and milk. The root word of Imbolc is said to be of either one of two origins: i mbolc, meaning "in the belly" or oimelc, meaning "ewe's milk." 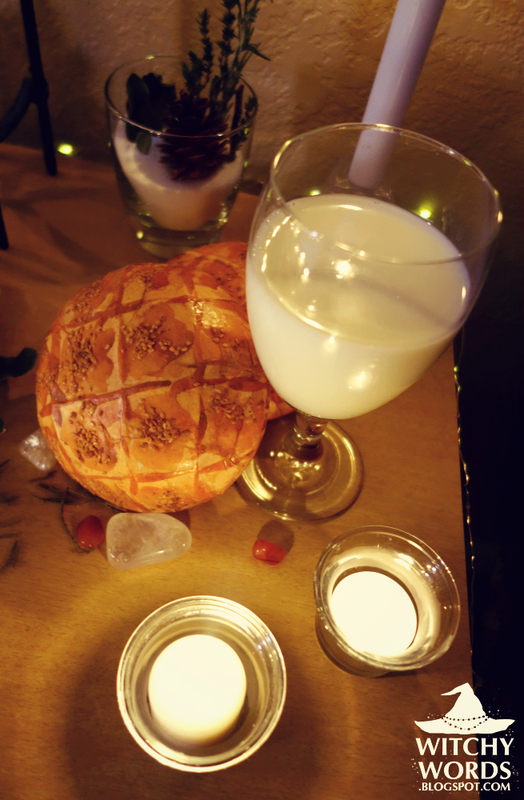 In Wiccan lore, it represents the milk in the breast of the Goddess awaiting the young God. Either way, milk and dairy have become highly associated with this holiday. And what better way to use that dairy than to make filling, nutritious bread, particularly since Brigid is sometimes associated as the "Grain Goddess." 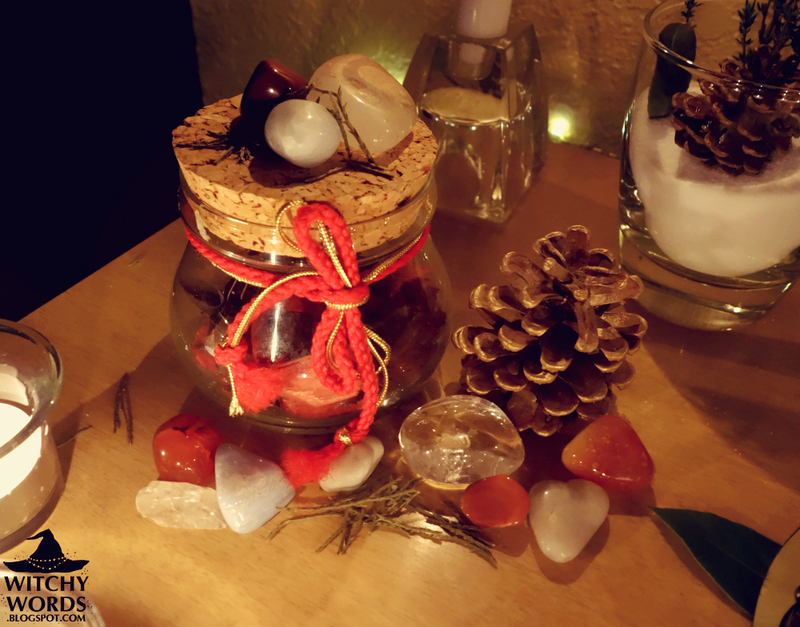 On the other side of the altar is a jar of herbal offerings, including rose petals for love, cinnamon for protection, star anise for meditation (as is often needed before new beginnings), and pine cones. Pine cones have a variety of meanings, the root of which is eternal life. Here, that calls upon regeneration and fertility. Along with those offerings are a variety of stones, including quartz for ice and purification, carnelian for the sun and energy, and moonstone for balance and the feminine. Sprinkled about the altar are cedar needles. Cedar is often called the "Tree of Life," and is associated with grounding. Like meditation, grounding is also needed before starting something new - before sowing the seeds of spring. Brigid represents the sacred flame, so it is only natural that this is represented by loading the altar with candles. In a more secular viewpoint, we are officially starting to notice the longer days since the solstice. These candles call upon the sun for warmth and a prosperous spring. My Imbolc altar always includes "Imbolc in a cup." Here, I've filled the cup with salt. Salt is strongly associated with purification, as is water. Similarly, the snow is seen as purifying the earth, making way for the new. The salt represents the cleansing properties of snow. 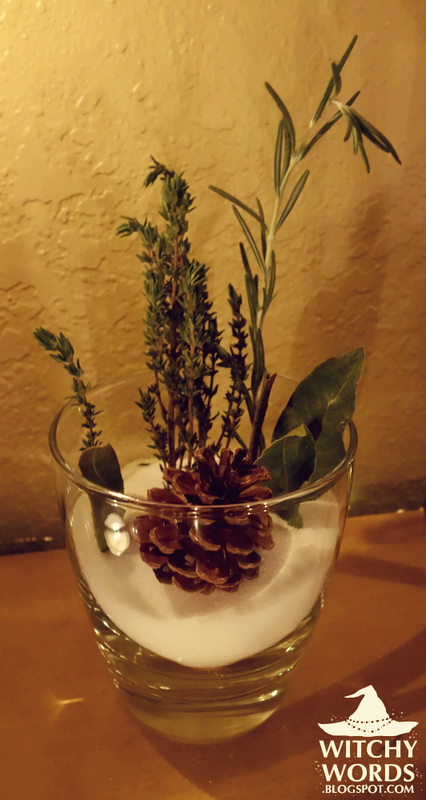 The herbs inside of the glass symbolize the budding life under the snow. I've used bay leaves, which are often used for wishes and growth. Wishes are the start of something new, the beginning, which is rather perfect for Imbolc. I've also chosen thyme for healing as the earth heals itself for spring and rosemary for remembrance of the year past to aid in the year ahead. The colors on the altar include white for snow and purity, red for the rising sun and the blood of life, as well as hints of green for plants and growth. The primary focus is on white, however, because we are still in the midst of winter. Despite having a rather mild winter this year in Kansas City, we're likely seeing some snowfall on the day before Imbolc. How appropriate! I'll leave you with a visual explanation of the altar, summarizing all of the above. Enjoy! 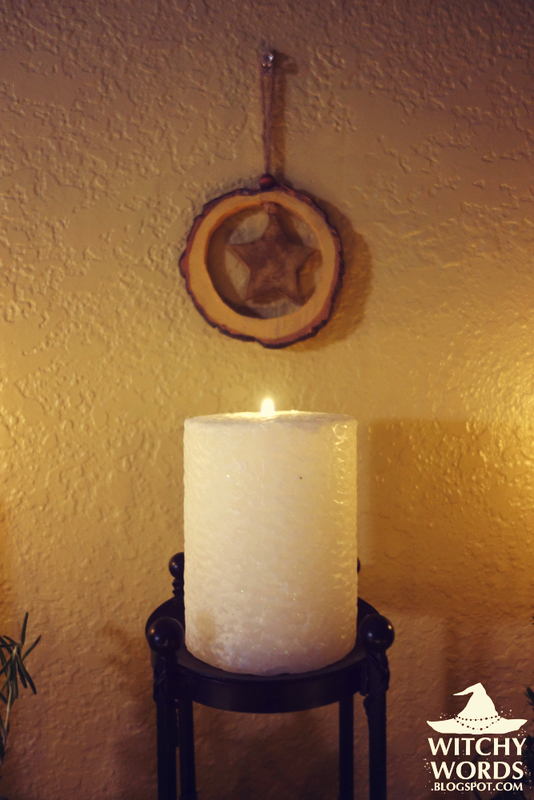 Coming soon: Circle of Fountain's Imbolc celebration and ritual! A beautiful altar, as always. I have a question though. Do you reuse candles? Not tealights, but the big pillar candles. I have a lot of pillar candles and would never be able to let them burn down over the course of just one day. I do reuse pillar candles. I believe the universe understands the need for thriftiness and recycling. Usually, I give them a saltwater bath (if I can) and smudge them beforehand. 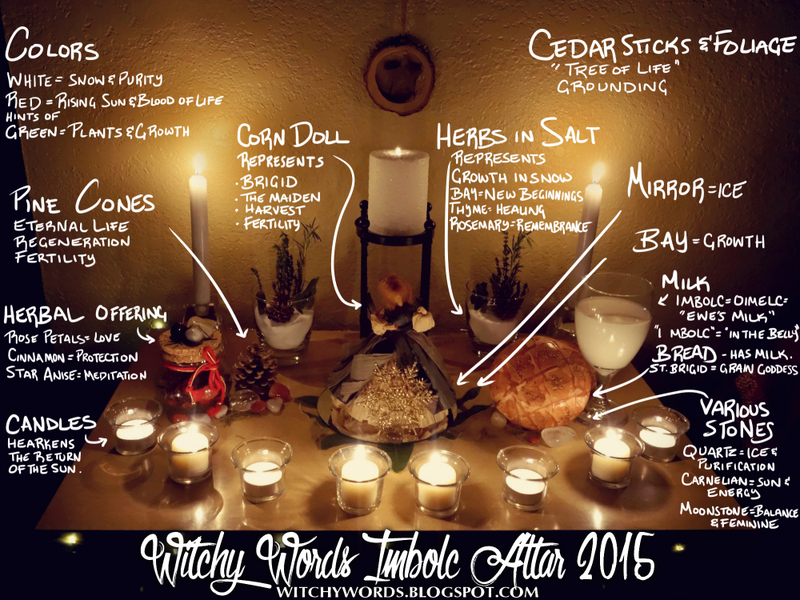 This candle was actually also used on the ritual altar for Yule. That is so smart! I actually make some of my own candles, but I only have the mold for pillar ones. Thanks a bunch. Where did you find your beautiful corn doll? A thrift store! It's clear she was holding something between her hands at one point, but I love her exactly as she is. Thank you! 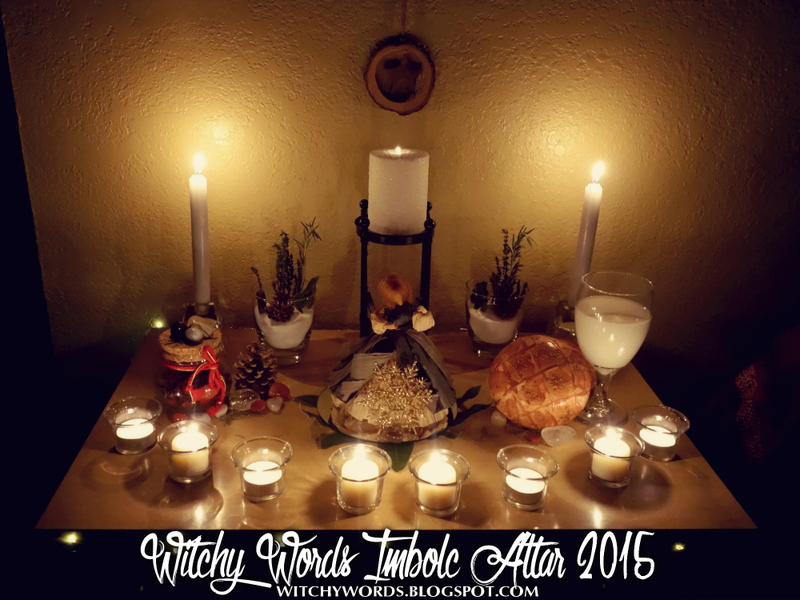 Coming back in 2016 to get inspiration for this beautiful altar! You have found a Nan's cornhusk doll that I believe originally held a Christmas wreath.. I've always wondered where she came from. 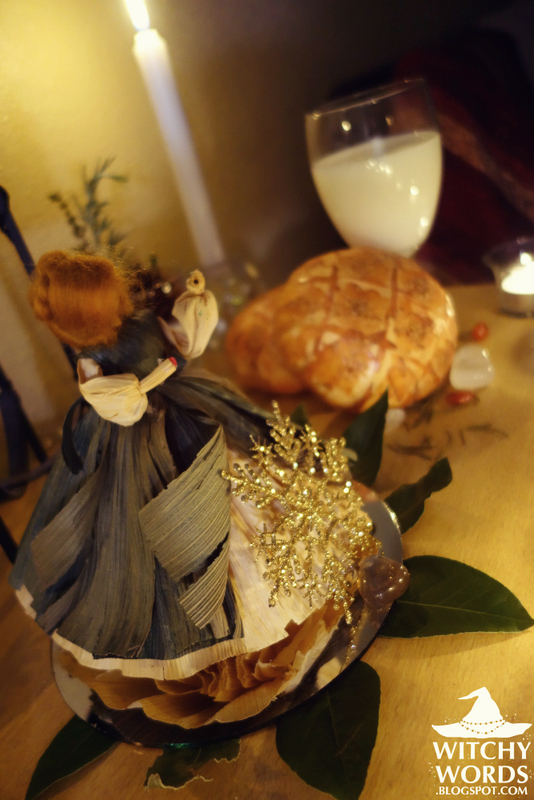 I got her from a thrift store and, since I'm not particularly good with corn husks myself, she's worked well as representation on my altars. Very nice. Practical question- do you change the milk regularly and how long will the bread hold up? How long will this altar be in place? Typically, food-based offerings are left just for the day of the sabbat and then put outside. The altar itself is up until I change it out, which is usually around the following sabbat, but the food is only present for a day or two. Thank you so much, Angelica! These little corn husk dolls are certainly making their way through thrift stores. I've ran into a few since but none of them have called to me quite like this one did!